If purchasing garfish whole, the gut must be removed very carefully to avoid staining the flesh with the gut contents. To remove bones, put the fish belly-side down and roll along the length of the backbones a few times with a rolling pin. This separates the bones from the flesh, allowing them to be removed easily. Fish can be butterflied or prepared whole with heads. Sprinkle the garfish with lemon juice. Coat the fish lightly in flour that has been seasoned with the thyme, salt and pepper. 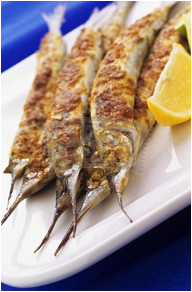 Dip into beaten egg and then roll in breadcrumbs.Deep fry the garfish in oil and serve with a green salad and lemon.